【STURDY,DURABLE QUALITY】The stainless steel cap keeps plastic away completely accompany with the silicone circle make the bottle leak-proof. 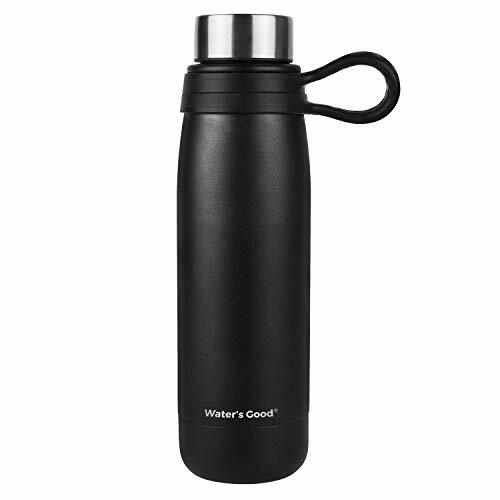 WATER'S GOOD sport water bottle made from food grade double wall 18/8 stainless steel .Keeps cold 24 hrs,hot 12hrs. 【RIGHT SIZI】 Meet your everyday hydration needs in one containers,keeping it piping hot or ice cold all while.You can add ice cubes easily from the 1.65 inch mouth which is wider than other cola shaped water bottle. And you will not be scalded by hot water easily. 【EASY TO CARRY 】The silicone adjustable handle is perfect for outdoors,you can take the portable sport water bottle in your hand or put it in your gym bag, backpack or briefcase as your daily companion. 2.76 inch bottom diameter make the flask fit for most vehicles' cup holder and bike racks. 【SLIP FREE GRIP】The WG-NB1006 water flask has a powder coat which gives a solid grip. 【PERFECT GIFT FOR FAMILY AND FRIENDS】We makes the logo smaller so that you can do decorate with monogram personalized.It is a perfect present for your mother ,father ,friends and whoever you love. If you have any questions about this product by WATER'S GOOD, contact us by completing and submitting the form below. If you are looking for a specif part number, please include it with your message.